This being a kind of modern version of “Frankenstein“, is the least you can say. Even the name of the doctor in question is identical with that of Frankenstein. The only difference with the classic movie is that new life isn’t created by sewing together human body parts, but by making use of modern day technology. 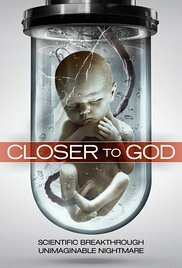 Cloning a human being is the central topic in this low-budget sci-fi horror. Don’t expect an alien looking creature as in “Splice“. This cloned human being looks perfectly normal and healthy. It’s not extremely creepy and intense at all. It’s the aspect of cloning and the controversy arising on this subject which are developed the most. The fuss, the media attention and the protest groups who are opposed to these practices and consider this more as a blasphemy than scientific progress, demand the most attention. The angry mob at the immense gate of Dr. Reed’s residence, is more terrifying than the additional secret that Victor is hiding on his domain. The movie fades from hight-tech SF to social drama. And ultimately it ends as a kind of psychopathic slasher. At first this surprises you, but eventually it looks rather routinely and not really innovative. What remains is a not so original low-budget monster story, embellished with high-tech-looking situations. A highly motivated geneticist who puts more energy into his work than in his family life, resulting in a wife who feels abandoned. The secret that painstakingly is separated from the outside world, is hidden from sight for a considerable time or displayed as a hazy shape in the background. It felt like an attempt to keep the suspense alive and postpone the disclosure as long as possible. Perhaps there should be restrictions and guidelines when it comes to cloning, so that we don’t end up with an uncontrollable process where superior specimen are being created. Or an illegal trade is being initiated, producing organs on demand. That a religious aspect also comes with it, is quite evident. Though it’s more of a dogmatic religious plea that no one should acquire the authority to create something. God has the exclusive rights for that, so they say. But then one must be able to admit that there are also advantages. Improving the quality of human life and removing those terrible diseases from the world. And there are also disadvantages. What to do with the failures ? And who’s going to pass judgment on that matter ? This diversity of views is the heart and essence of this rather modest SF horror story. The whole movie feels like a creation out of the 70’s. The décor and presentation, the style of interactions, the overall atmosphere and the meager horror elements. Eventually, it’s just like a typical movie that you can see on Syfy. In the 80s it would fit in between “The Entity” and “Critters” during a VHS marathon at the weekend. The only similarity between Jeremy Childs and the Frankenstein monster, is his imposing stature. A walking wardrobe with a facial expression that shows no emotion. Not even while handling the cloned baby. It’s all done on automatic pilot without much feelings. The subject of this movie and the reaction of the community comes across as being weighty. However, the film on itself, is nothing but a lightweight.